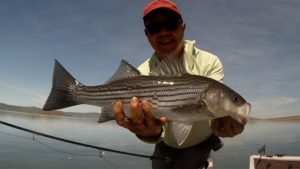 Saturday April 12, 2019 -I use to think that after enough seasons on the lake, it would become easier to find fish each month of the year. The similar weather, moons, temperatures, would mean the fish would behave the same. The problem with that is every year the level of the lake varies from the previous year based on the rain and the pump schedules. Last year, the lake was not as full as it is this year in April. In addition, the algae mat has started earlier. Algae changes where the bait hangs out and I seem to do well in places where the mat is thick. Others have noticed that as well and maybe its because of the shade it provides or the cover it gives bait. The lake was in fine shape today and it was an “all you could eat” day and no dinks as in past years. I lost count after 30 fish and it was steady all day. I launched on the lake at 9:00 (Im still jet lagged from Australia) and fished till 4:00. I used yellow, brown and gray, three inch craft fur clousers with a #3 pulse disc all day. Fishing the Bay of Pigs under the algae mat near shore was very productive today. I picked up 15 fish in BOP mostly on fast strips with long pauses. Experimenting with the pulse discs again today I think they really work well when the algae makes the visibility in the lake low. I had light hits where the fish came back and hit the fly 20 feet away from the first tap with the visibility in the algae filled water only about 3 feet. I think that the fish after missing the fly hear the pulse disc and swim towards it. I fished the fly with fast strips after missing the first hit to pulse the fly and then I would let it sit and give it short strips waiting for the fish to catch up. This seemed to work well. Fish seemed to locate the fly well in low visibility. After fishing the BOP, I worked my way up the dam picking up fish every 15 minutes casting to the rocks and fishing it down the face of the dam. The fish were deep. I think they cruise the bottom of the algae mat thats about 20 feet down. I think it might be time to put the Triton underwater drone down to see if the water is clear under the algae. I think the algae is early this year. We haven’t had much heat yet and we are expecting rain next week. Fishing the rocks on the dam is pretty consistent for me. I think the fish cruise the dam and lots of hardware guys in float tubes and Kayaks were fishing up and down the dam casting parallel to the dam with crank baits and flukes. The highlight of the day was getting kicked off the trash racks. I worked my way down to the trash racks when I thought the guard had left around 2:00pm. I fished the south pier and found schools of stripers cruising the water around the trash racks. After half a dozen fish up close, Vaughn pulled up in the Reatta and started fishing the north pier and it wasn’t long till I spotted the White Car coming up the dam to kick us out. I had a fish on and I pulled out 500 feet off the north pier and noticed even bigger schools of fish under the boat only 20-30 feet down Vaughn pulled up next to me and also metered large schools 20 feet down. We were in 250 feet of water. I pulled out my Nike Golf Range Finder and confirmed that we were exactly 167 yards out well outside the Forbiden Zone. I had fished schools like this about 7 years ago when I learned to fish with two rods letting on sink while stripping the other. You need a two rod fishing license to do this. Every fish caught that way seemed to bring up a school of fish following it in. Even though we were nearly in the middle of the lake, there was still an algae layer in the lake. Both Vaughn and I caught fish in the deep on the long count and I fished the deep after Vaughn left catching fish till I left at 4:00PM. As I drifted off the schools, when the fishing slowed down, I would repeat the drift. Finding deep schools of fish and fishing two rods like this is a good way to save a slow day and just maybe its alway this productive somewhere deep on the lake. I kept a couple fish to eat, both fish were over 20 inches and they were undergoing spawning changes. 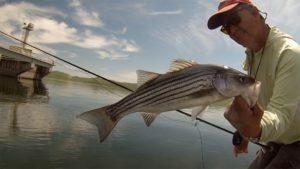 The water is warming up and its the season for striper love. The fish are fat and healthy and transforming. Yesterday was an interesting day on the big lake. I fished with Tubin Louie in the Reata. There was only one trailer in the parking lot at Diino and we only say two other boats on the lake. The weather was sunny, calm, and warm all day. We found fish in Big Windy, along the rock wall on Hwy 152, and in BOP. Tube caught roughly 25 fish to 4 pounds on a small (very small, like 2 1/2 inches) flash tail clouser, which worked for him all day long. Eventually I caught 12 or 15 fish using a slightly larger (3 inches) flash tail clouser. I changed flies through the morning until I found one small enough to consistently get the stripers to eat it. There is a lesson in there somewhere…. There is algae everywhere in the lake. 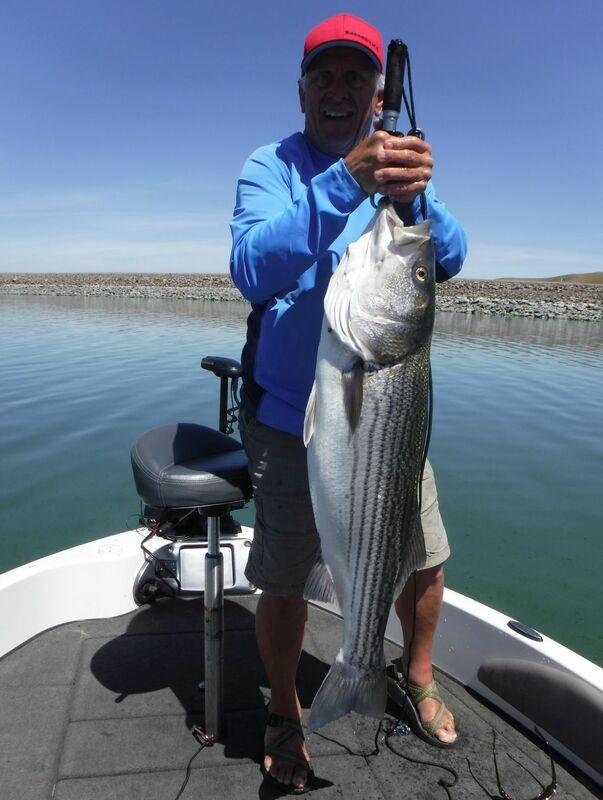 The algae in BOP was nice and thick and it covered lots of stripers, including the two biggest stripers I have caught this year: a 10 pounder and then a 19 pounder! Thanks to Louie for taking photos of those two fish and sending them to me! See photos below. The boat is covered with small green spots that match the green spots on my shirt and shorts. There are little splatters of algae everywhere. Unfortunately, we were not able to restart the 19 pounder, so it became filets last night, once I got home. Thanks to Louie for coming along yesterday–it was a pretty remarkable day! Just two days after Vaughns Personal Best on San Luis, he did it again with Dan Blanton in his boat. I fished the big lake today with Dan B. Overall, it was a slow day: we got 14 fish for the two of us. On the other hand, it was a phenomenal day: I caught a fish over 20 pounds. That makes 3 fish over 10 pounds this week. Wow…. Lucky man, I am! Honesty compels me to include the following details: we did not get a weight on the fish because I thought the Boga in my gear bag was my 15# Boga (it was actually me 30 pounder). The fish was clearly more than 15#’s so we didn’t even try to weigh it. Damn! When I got home, I discovered my error. It would have been good to get her weight, just to have solid data in my memory banks…. In the meantime, Dan took every opportunity through the afternoon to remind me a 15# Boga is inadequate to the task at San Luis…. No kidding–live and learn! One truly positive note: the fish revived and swam away on her own power–very cool. Dan may send some other pics this weekend; I’ll forward them to y’all. I can’t wait to get out there again. 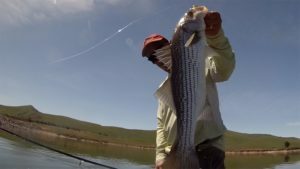 Good fishing buddy Vaughn Willett and I hit San Luis yesterday despite the full moon – hey it was a gorgeous morning and what the hell, you never know… Well despite finding large numbers of bait and fish, the catching was a bit slow at least for me. I was trying a new line and maybe that factored in. I only caught 3 of the 14 we brought to hand. 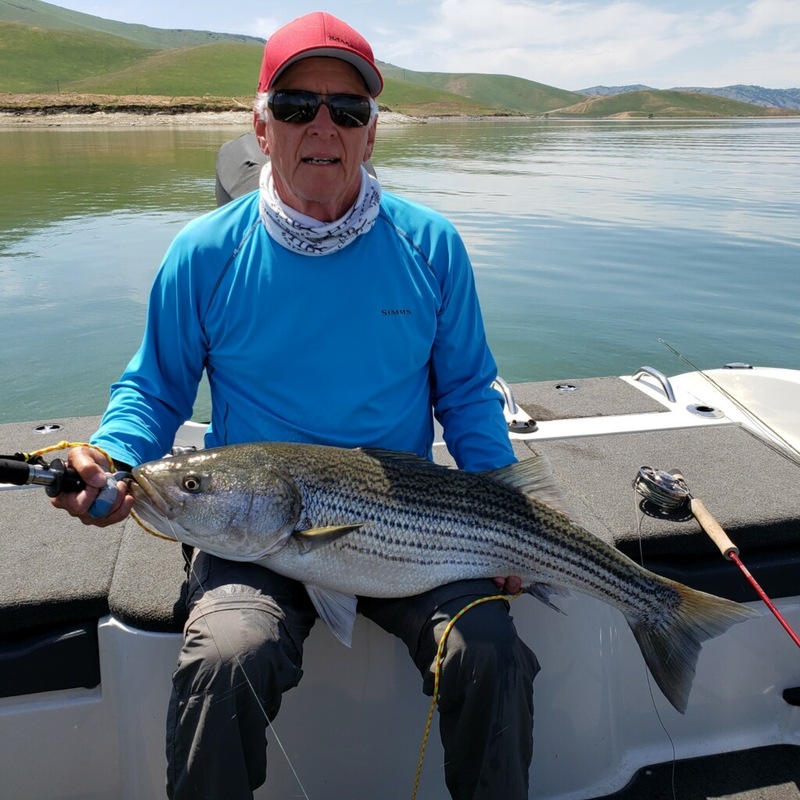 The highlight of the day was when Vaughn tied into a really good fish (remember San Luis is the Lake of Giants) that showed him some of his backing. After a good tussle and lots of huffing and puffing coming from Vaughn, he brought a beautiful 22-pounder to hand. After a few photos we took plenty of time to revive the fish and it headed for the depths and sanctuary without hesitation. Vaughn also scored a 10- and a 19-pounder Wednesday past. The man is on a big fish tear. I’m always happy to see a boat partner score a good fish. Congrats to Vaughn.Also on the lake (the only other fly-boat wee saw) was Captain Maury Hatch with two regular clients. 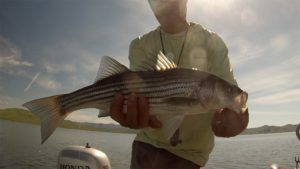 They were catching medium-all-purpose stripers with some regularity. They said they saw a fly-rodder land a 25-pounder fishing from a stand-up vessel of some kind. They don’t call it Bay of Pigs for nothing…Wind Finder website had predicted the wind would come up hard around 2:30 p.m. out of the west and they nailed it so we headed back across a bumpy lake to the Dino ramp and called it a good day. I think I’m going to go back to my old, reliable RIO Outbound T-14 Custom cut… Next time! It’s about time we see some good reports! Did that fly you jiggle around catch all the fish?